Jira Service Desk Review: "There are a lot better options. Best with a lot of KEBD present already!" We added Confluence to Jira Service Desk which made automated knowledge base suggestions so easy for our customers to look at, and use if they can, as well as reduced our ticket count dearly. They also helped in having a better utilization of the current knowledge base and help trigger making newer documents to enable self-service with the users. Since the user base grew, this was eventually replaced with Service Now. Great use of knowledge base. Interactive with the customers to create tickets and shows better suggestions with the existing KEBD. Helped automate a lot of tasks which were similar or repetitive. Would throw out errors a lot and needed support to come in and fix the infrastructure. Knowledge base handling was poor at times and queries would get lost in translation. User's complaints with Jira increased for having the ability to navigate a few times which became frustrating. I would say a for a tech-savvy user base, this solution would work better with respect to how the interface is. An industry with a large and detailed knowledge base can really take advantage of Jira Service Desk's integration with KEBD. Jira Service Desk Review: "A Few Tweaks, Or Ability To Tweak, Would Make This Product Great To Work With"
We use Jira Service Desk as a corporate service desk. All issues within our company are submitted through the service desk portal and are then triaged to the specific groups that can help with the issue. We have set up multiple service desks for each specific group that are managed by the small teams in our department and that seems to work great. Easy to use for users. It's a little difficult in terms configuration- you should have someone dedicated to administration. For as customizable as it is, there are some things you can't change. These small issues that don't really effect an individual ticket too much, but when you are dealing with dozens and dozens of tickets a day, small granular things add up. A suggestion for improvement would be to allow a hotkey entry for quickly submitting a comment. You can do that for an internal comment (not seen by the user), but not for a public comment. Honestly, I think it's great for all situations. You might have some issues if you're a small company that doesn't have someone to set up and manage it in its infancy; you might struggle to get it up and running. But in many other cases, it's suitable. I'd also recommend it if you're already using the Jira suite. 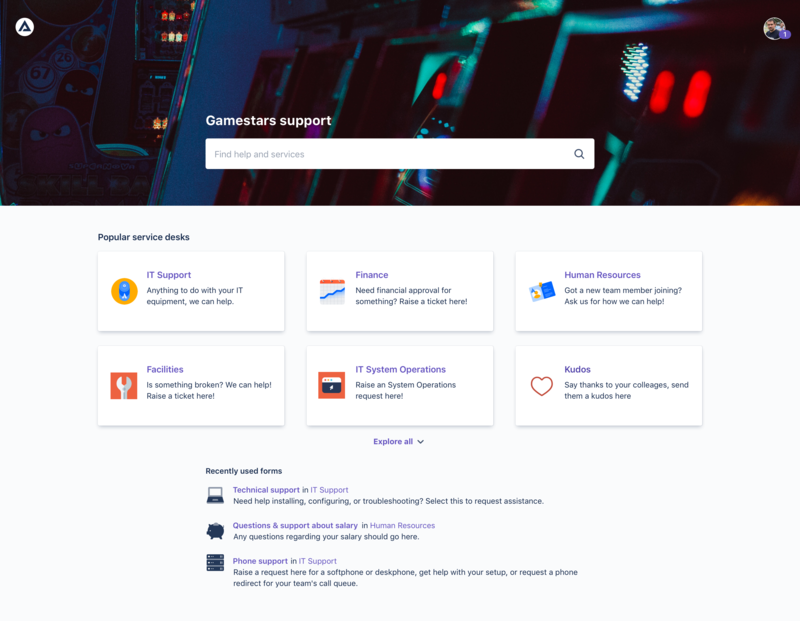 Jira Service Desk Review: "Jira As a Service Desk"
We use JIRA Service Desk to collect our customers’ requests such as issues, problems, new features, and on-site work requests. We needed a software such as JIRA Service Desk to manage all these requests and provide timely and proper customer service. Service Desk can be integrated with JIRA, which helps you to involve software development teams easily and trace the development progress. Service Desk can be integrated with Confluence. Thus you can provide a good knowledge base to your customers. Third party Plugins from the community provide absent features. Thus you don’t need to wait for Atlassian to implement long-awaited features. 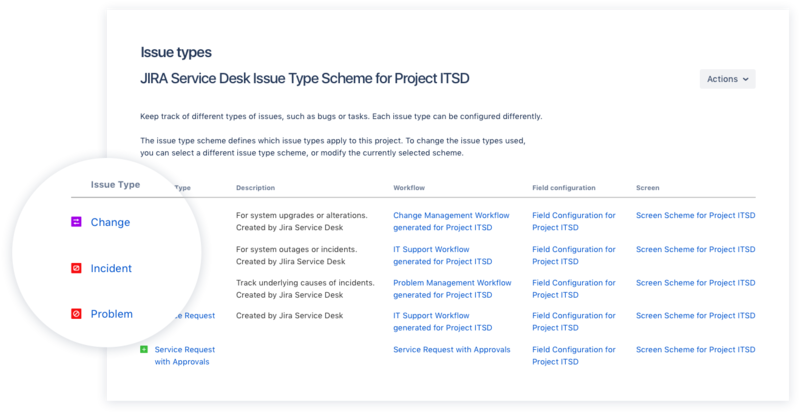 JIRA Service Desk gives you the ability to use different workflows for different types of issues. You may create your own workflows. It gives you the ability to create conditional actions. Their customer portal is very clean. To open a new case or monitor open cases is simple. It would be great if more of it were like the portal. It would be great if we could share some reports. Putting customers’ employees in a team is possible, but doesn’t fix some problems from a flexibility point of view. It needs some improvement. Conditional notifications to third parties are limited. Eg. We are an integrator company, and our projects require us to route some issues to our partner companies’ service desk systems automatically due to SLA agreements, which is not easily possible. Historically, Service Desk was designed as an in-company Service Desk software as part of JIRA. At the beginning, it was awful to use it if you give service to your enterprise customers, due to the lack of features such as customer teams. For now, it is better. Still, its native design is for in-company individual customers. However, it's built-in integration with JIRA, Confluence, some other great products from Atlassian, and its capabilities to integrate with third-party apps makes it great. Jira Service Desk Review: "JIRA Rules!" We use Jira Service Desk to manage all of our IT tickets as well as our IT contracts. It does a great job of keeping everything in one place. We also chose to utilize this as our inventory tracking system and it is working well in that regard as well. It was a little tricky to set up but once you get it working how like it just works. This works well in our mid-sized organization. It does a perfect job keeping track of all of our tickets and assets. I haven't had any issues with the software at all besides it needing an occasional restart. Jira Service Desk Review: "JIRA - the game changer!" Jira is being used by multiple departments across my organization (Client Service, Financial Service, Tech Engineering, etc). Previously, my company was using a tool (designed in-house) to intake, prioritize, and track tickets submitted for development (maintenance, bugs, enhancements). The downside of this legacy technology was mainly reporting capabilities. We were unable to do a proper post-mortem in order to determine what areas of the overall process could be improved (if deadlines were not met). allows multiple users to collaborate on the same project with ease. offers multiple reporting options to track tickets. automated emails relating to updates - users are always notified when they need to take action on a particular task. Jira does not seem to like IE. It is much quicker on Chrome. Can be overwhelming for a new user. Training resources are somewhat limited. I wish there was a way to set rules behind automated emails. Example: only send emails when status or assignee has changed. Jira is a great tool for organizations who already have a well-defined process for tickets/projects. If your organization does not have multiple stakeholders who take part in tickets/projects this tool may not be the best fit. It makes QA much easier since all communication between QA team and developers are in once place (with screenshots, short videos, etc). Jira Service Desk Review: "Jira it is if it is IT." Currently, we use Jira Service Desk for receiving, tracking and responding to our online customers who might have queries. We keep a track on all queries, the effort needed to respond to the queries, and simultaneously we also forward queries that are a little more complex to the development and product teams. We also use Jira Service Desk in the marketing team to gain insights into the kind of queries received. Jira Service Desk is a great tool for teams that are already using it. For example, IT teams can save a great bit of time and effort using it, but the real problem comes when a marketing team is involved because the functionality is so limited from a marketing standpoint. However, for the IT teams, it probably is one of the easiest tools to work with—great features and customizations. Jira Service Desk Review: "Ideal tool for tracking requests if your team is already using JIRA for Sprint planning"
Appropriate for teams that are already using JIRA to manage their sprints and workload. Jira Service Desk Review: "SharePoint admin enjoyed using Jira"
It was being used for project management, tracking progress, questions and collaboration while using Agile methodology. It was also used to document procedures of how to do something in SharePoint, SP Designer and migrating data from company sandbox to customer platform. Jira was utilized to document meetings, ideas and scrum discussions. It is compatible for Agile methodology where it lends a platform of sufficient communication, accountability of tasks and provided a space for a group email. This prevented replication of tasks that were already completed or decisions already made without having to pester the project lead on what was discussed if you missed a casual meeting or scrum. Search results in Confluence does not work well if you begin with a spacename at the beginning. For example, if I were to list something as "abc def" and search under "def", results are not found. Issue tracking can be cumbersome when colleagues overload or customize it. Jira tends to force premature convergence of a process, then making it inconvenient to change it. Suitable application for agile methodology. Good platform for issue tracking and documenting processes already discussed and or implemented. Even though the company I worked for paid for this subscription, I found out that it is more cost effective than legacy systems. The portal is intuitive to use in order to monitor progress of service tickets. Tickets can be displayed as "issue links" where developers can work on them before the ticket escalates. Jira Service Desk Review: "Smart solution for a good price"
JIRA is used to keep track of the open requirements of our external clients. It is used for every user in the company. The main problem addressed is to respond to customer requirements within agreed SLA to keep our external customers happy and not to impact the daily operations and help them achieve goals. Review: "Jira Service Desk - A product worth looking at"
Jira is being used primarily by our Information Technology department. It is being used for task management, project management, and time management. Jira helps us to stay organized all in one place. Task management - There are many options when creating a task that should fit a variety of use cases. It works well to keep everyone accountable. BigPicture - Gantt has been useful for the breakdown of very large projects. We can track multiple phases and see where most of our time was spent. Jira allows you to track hours worked on projects, this has been helpful to determine how long similar tasks/projects will take. The number of options can be overwhelming for the average user. A simple task creation becomes surprisingly complex. Proper training is important. My Task Dashboard could be displayed in a way that is more useful to myself. An interface with more information and displayed tasks all on one screen would be nice. Jira is suited for large companies that are looking for a service desk solution that can aid in time management and task management. The number of options may be overwhelming for a smaller company or for a group looking for simple task creation and management. Jira Service Desk Review: "JIRA for your Project... Good or Bad?" We use JIRA in our project to keep track of individuals' work, as well as to collaborate all the tasks and documents at one place. We use its Confluence integration feature to keep all the documents present in Confluence available to all. We simultaneously keep track of all tasks using JIRA. We track which tasks are completed, which are pending, and how much effort is required to complete them. Documentation is reduced, because we do not need to maintain Excel sheets to keep track of all the tasks. The service desk allows us to do that with minimal documentation. Taking an example of a defect that comes up during testing, this defect can also be raised here and its progress can be monitored by the developer, the tester, as well as all the participants involved. This makes it the single point where everything in the project is tracked. All the updates in the task assigned to a person are received via mail and there is no need to check the portal again and again, which surely saves time. The portal can be a bit difficult to understand at the start. Because there are too many features. So there is a chance that if the UI were improved, this would be made a bit simpler. The user could understand better and more quickly, improving the efficiency of the tool. Although the tool is really powerful right now, it could be made a bit more automatic. That is, it could help the user in some basic tasks like creating categories of tasks and automatically, adding some sub tasks, and logging some work which would be editable by user. But giving the user something to start with would save a lot of time. Also there should be a weekly alert showing the hours logged into the portal, which can help the user track his work, how much he has logged in. So that one can log accordingly. It is appropriate for projects where there are many tasks involved that are distributed among people, this can help make the tracking of tasks easy. It is also good because of Confluence integration for projects with a lot of documentations. Jira Service Desk Review: "JIRA- easy to use even for beginners"
JIRA is used to track our day to day tickets and user stories to be accomplished for a particular sprint. Most of the projects in our organization use this and it helps to easily track our progress and when a particular thing has to be done. Most of the times while calculating the pending hours or minutes it doesn't show the correct amount. Due to this, some tickets cannot be closed. While loading the page it'll be slow sometimes. Sending e-mail through the ticket really helps to communicate easily. Jira Service Desk Review: "JIRA, the best service ticket and agile system for your development and IT"
We use JIRA service desk for issues reporting, IT ticket, software and permission changes request, etc...So for example, when a user needs something, they will open a ticket with their request and depending on the request type, we send the ticket to the queue so the team can work it. We also use it for our backlog grooming, for our agile work, and for development team stories build and tracking. It is amazing for your development team if they use agile for their sprint and stories. Jira Service Desk Review: "Efficient & Effective Tool for IT Service Management"
Our team uses JIRA to raise tickets for our IT team and to submit talks/projects for our marketing and audience development teams. It started out as an easy way for us to get any development issues in the weekly and monthly IT sprints. Now, we also use it to collaborate on the creation of email newsletters, campaigns, etc. It's been great for tracking multi-user projects, sharing large files, etc. The email notifications from JIRA can get a little busy/cluttered. For example, if someone replies to an email from JIRA, the comments appear in JIRA and include their email signature, along with any images from their email signature. Then, those images appear in the attachments for that particular job. This sometimes causes projects to get a little disorganized. JIRA is the perfect solution for project/sprint management in an IT department. It's a great way to raise issues for IT and to get quick updates on their progress managing those bugs/issues. While it can also be used for marketing/content project management and job submissions, I do think there are better solutions for teams outside of IT. Basecamp and Trello are two good options for more basic project management. Jira Service Desk Review: "Great Service Desk"
Jira Service Desk is mainly being used by our Helpdesk team to receive, answer, filter, and escalate our internal requests from employees. The main users would be our Helpdesk team as they receive all tickets/requests and respond or pass them along to other teams within Jira, but you could say it is used by the whole organization because if anyone has an issue or request it is funneled through Jira Service desk. Easy to move tickets over to other boards with Jira if needing to escalate issues to Development or other teams. Jira Service Desk is very well suited for any organization that also uses Jira Software for Development or other teams for their task tracking and all. Jira Service Desk makes it very easy to take the ticket and move it to another board and assign it to someone to get worked on. Jira Service Desk Review: "Service Desk makes help desk work easier"
Service Desk is used across the entire organization for all help desk tickets, including software issues, hardware and new hire employees. It replaced an older Microsoft version we used for our help desk which was dated and hard to use and administer. We are currently looking at new departments we can add to it as well. Perfect for tracking all your help desk tickets across the organization, including software, hardware, new hire employees, also works for change management functions for IT when things go into production environment. The approval feature for manages when employees submit a request is also very good. We are moving to allow Real Estate tickets to go as well. Jira Service Desk Review: "JIRA is a great ticket management system"
We use JIRA every day to manage the requests that come from all parts of the e-com department. There are many teams within the e-com department so we categorize the requests by component. Requests are stored and tracked in JIRA by sprint and team. Everyone can see the status of their request, comment and see when it is scheduled for deployment. The tracking of tickets by the component is incredibly useful. I can quickly see all the tickets that relate to my team's work and see the status, priority, who it is assigned to, etc. The filtering and reporting are very nice as well. You are able to quickly create a board of any combination of information you would like to see and reference it at any time. The tagging feature works very well too. You can tag a developer or analyst with a question or comment and they will immediately see this and be able to respond. It keeps issues from getting lost. I wish there was a better view of the current sprint. There are views available for this, but they do not seem to be very customizable. It would be nice if when I run into something that I don't have access to, I could send a request to our system administrator from within JIRA. Sometimes it is hard to communicate exactly what I need access to and sending the request from a specific screen in JIRA could simplify this. I wish that clicking a link in a ticket would open in a new tab. I do not want a link to a document or website to replace the ticket tab that I currently have open. When we do our sprint planning meetings, it is incredibly useful to see all tickets assigned to our team. We can very easily manage our backlog by priority or date created. You can get a very good overview of how the backlog is coming along based on these custom views we have created. JIRA Service Desk (JSD) is used by our organization to submit bugs and enhancements. It is being used by almost the whole organization. It helps us gather specific information from the users when they submit the requests and also guides the users so they know exactly what kind of information we will need when they submit the requests. It guides the users submitting the requests in understanding what kind of information the one receiving the requests needs. I think it is a pretty good user experience and is easy to use. I think it is well suited for submitting bugs and enhancements. User Review: "I really like Jira Service Desk"
We mainly used this product to manage all the task in charge of devs, support team, and IT in general. JIRA is really good and we are so happy using it, even if you just wanna test it you can go for the basic version which is really cheap. Jira Service Desk Review: "House of Organization"
JIRA is primarily used as our bug database for issues that are found while testing our software. It houses our 20+ projects and works great for housing our bug tickets in a very organized manor. JIRA is also used for tracking the development of the current sprint that the engineers are working on. JIRA has some great features and links to other software tools such as TestRail and Confluence. Linking JIRA tickets to a test planning software life TestRail is great tool as you can link the JIRA ticket in TestRail and then see the results to the test in JIRA or have a quick link to open the ticket in a new browser from TestRail. The organization that we are able to create with JIRA is invaluable between grouping tickets via build numbers or creating central location for information on a development sprint. Using JIRA as a tool to create a task orientated ticket that has instructions and information that can be given to a third party contractor in order for them to run a detailed test plan on your software. JIRA does have a tendency to make visual changes to the UI more often than is wanted or warranted. It does seem like just as you get used to one UI a new one is available. When searching tickets for a specific type of issue it can be difficult to find what you are looking for unless you are very specific. If used incorrectly the workflow life cycle of a regular JIRA bug ticket can have create road blocks that requires you to restart the life cycle and retread the steps in order to finalize and close out a bug after it has been fixed. Organizing a software project with tickets ranging from Bugs to Tasks to Feedback, JIRA works very well to house a wide variety to tickets for different situations or scenarios. The ability to link JIRA tickets to other software tools is invaluable and beyond useful for seeing the progress or keeping track or work done in a separate software application. The ease of adding in attachments is great so that you can show what problem you found via a picture or video file. Jira Service Desk Review: "Just say YES to Jira (Service Desk) you wont regret it!" JIRA Service Desk is used for all of our activities. Each activity is a task, therefore we can easily generate our timesheet using JIRA Time Sheet and with that give cost and time information to affected parties i.e. management, customers but also to every user himself. That furthermore helps with project management and using special "IT-Help"-Projects to generate a self-service desk combined with Confluence as knowledge base. JIRA Service Desk used in all departments. I've been using JIRA and JIRA Service Desk for the last 6 years thru various companies and I'd use it in any other as well. It can be easily customized to any company's needs. Its license costs are cheap. There is zero to no training required. You can even use it just for one person's task and time-sheet. (I like to use it to keep track of applications when I decide to switch companies e.g.) there is no limitation, I've seen much between regular task/project-tracking, help-desk ticketing over sales/offer matching. If you can think about it, it's quite likely you can do it within the Atlassian universe. Jira Service Desk Review: "Best Project Management Software with great integration"
As a product manager, it helps me plan the next tasks the dev team will have to assess and work on. As a team, we have a better idea of the structure of each project (epic, story, sub-task). It also helps our QA guy a lot since he is more aware of what's ready for testing and what's not. He can associate bugs with some issues and then send it back to the dev team. We also have more visibility on what's ready to put in production. So as a whole, JIRA helps us organize our dev task workflow and makes us more efficient. It is very much user-friendly, too easy for reporting an issue and updating its status, especially attaching the screenshot very easily. JIRA Service Desk is the tool that allows all stakeholders to be more proactive to communicate transparently. It especially helps the development team to work on Agile/Scrum methodology perfectly. The tool is pretty intuitive and it only takes a few attempts before you understand how the system works. Customized reports are not really flexible, easy to learn and generate for quality metrics in particular. It is more effective for small to medium-sized companies. It might not be suitable for a larger company with more than 5000-6000 users; it's only scaleable to a certain point. The fields are not dynamics. Once we choose a field, only related values are shown instead of irrelevant values. It solves the need to assign work to QA, report defects with screen-shots, assign to a dev and set a status according to our workflow. It solves the need for me to see what's on my plate currently and what might be coming my way. It solves the need to report on tickets by state and user. Jira Service Desk Review: "JIRA is a powerful, but sometimes complicated tool for project management"
JIRA Service Desk was used to try and bring together information from all our ongoing projects into one place. We kept track of issues and features in progress for our projects, and we used the Kanban boards to plan work for each of our sprints. It was only used by my team, with the hope that others in the organization would try it and decide to use it as well. JIRA Service Desk is good for someone looking for a tool to collect and track project issues and planned features. It works well with teams and is very configurable. It's not great for someone looking for a simple Kanban board or for those not willing to take the time to get it set up and customized appropriately. Jira Service Desk Review: "Easy to use for both end users and agents"
Our intake team would not be able to survive without JIRA Service Desk. We direct all employees to the platform with any technical issue they have, and it keeps all of the requests organized and streamlined. We really like the collaboration functionality since we often have multiple people working on the same ticket, and being able to upload files and screenshots of the user experience makes working through the requisitions a million times more efficient. 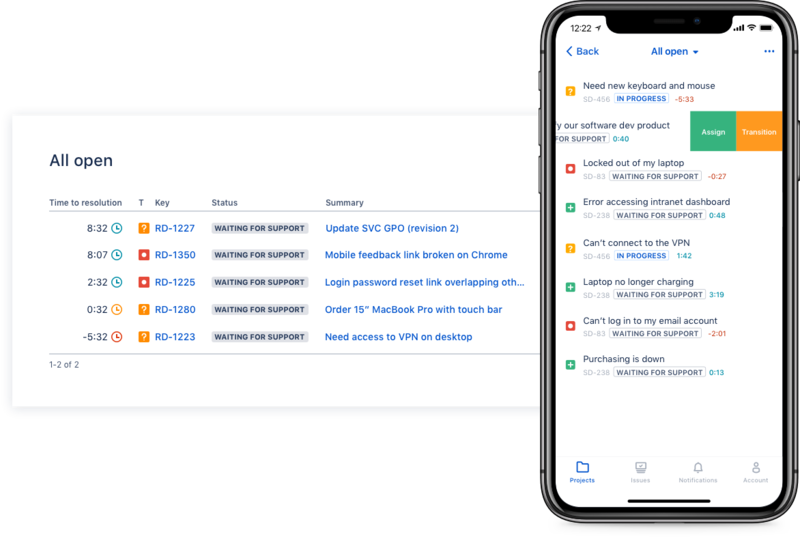 Review: "JIRA service desk connecting developers to issues"
We use it across the whole organization for tracking issues and planning tasks on development projects. It shows areas that need work and allows us to track progress on the projects and the issues within them to produce reports for management on the progress. It is easy to create dashboards to highlight the immediate needs of the project and filter out those issues that can wait until a later time. Notification options so that issues are highlighted to individuals when not using the app to ensure that important ones are not missed. At first glance, the package looks a little overwhelming. Maybe a basic/advanced view would help make it seem more friendly for new users. Well suited for teams working on large projects where you need to track issues and development and respond to problems that have arisen with end users. Overkill for very small projects or teams where you do not need such an extensive package to manage the issues and tasks on the projector within the team and would benefit from a more lightweight solution. Jira Service Desk is service desk software that is purpose-built for IT, service, and support teams. The software provides everything IT and support teams need out-of-the-box for service request, incident, problem and change management. Jira Service Desk integrates seamlessly with Jira Software so that IT and development teams can work better together. 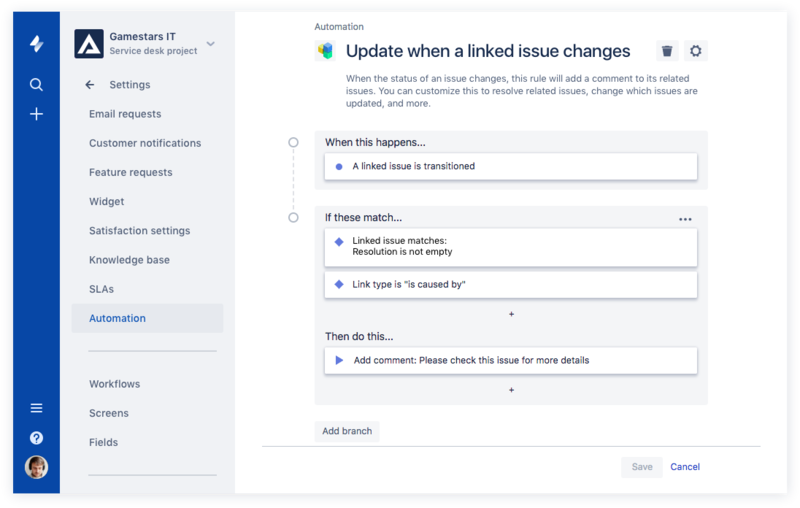 Users can connect service desk tickets to Jira Software issues and get to the root cause of problems before they escalate. Drive IT best practices with ITIL-ready templates. Get everything your IT teams need out of the box for service request, incident, problem, and change management.Get an ITIL certified service desk. Everything your IT teams need out-of-the-box for service request, incident, problem, and change management. Jira Service Desk is PinkVERIFY™ certified.Deliver a better service experience. 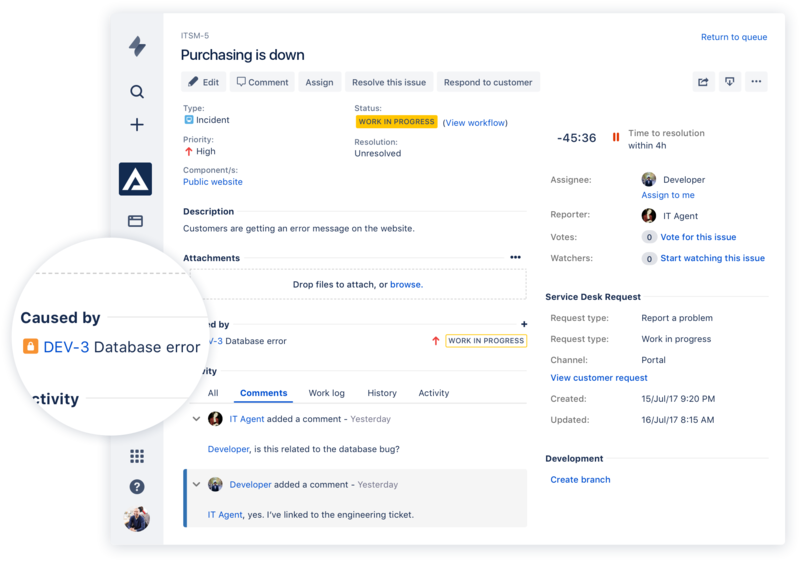 Customers or employees can submit requests with an easy-to-use help center and add Confluence to Jira Service Desk to get an integrated knowledge base. Machine learning intelligently recommends the right service and learns from every interaction, so answers are easy to find.Stay in the loop with developers. y linking Jira Service Desk with Jira Software, IT and developer teams can collaborate on one platform to fix incidents faster and push changes with confidence.Deliver on SLA's. Nail your Service Level Agreements, every time. Your agents get a simple queue so they get the important things done first. Configure and get going in minutes.Automate those repetitive tasks. Is your team stuck in gear with repetitive tasks or missing priority requests? Setup automations so your agents can focus on solving the important stuff and help lighten the workload.Gain complete control over your assets. 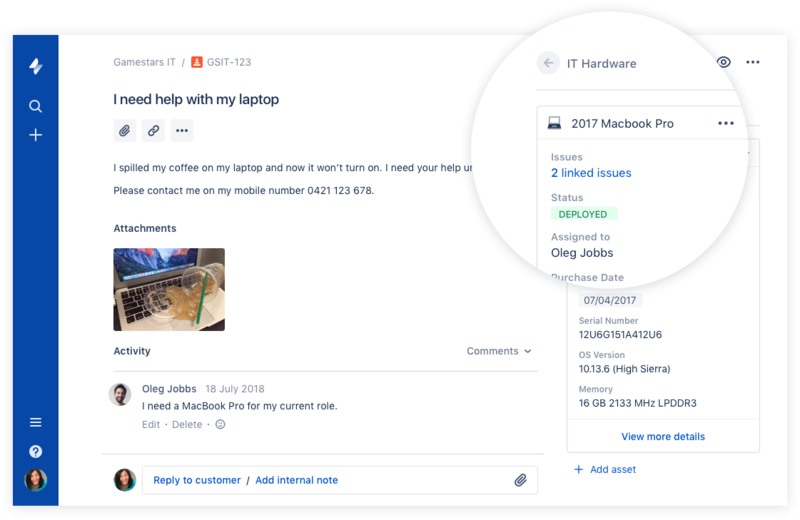 Connect your favorite asset management tool to reference, track, and tie requests with assets directly from Jira Service Desk. Provide end-to-end service with just a few clicks.